woven bag, carton box or as your needs. Basalt fiber is an emerging new inorganic environmental green high performance fiber material, which is a composite of basalt, silica, alumina, calcium oxide, iron oxide and other oxides of titanium oxide at a high temperature 1450 °C basalt ~ 1500 °C after melting, quickly drawn through the drain board made. Basalt tape is made with a special weaving process is made with environmentally friendly, non-toxic, reusable, good insulation effect, temperature at -260 degrees to 980 degrees. Basalt fiber fireproof materials, high temperature materials, reinforced materials, corrosion resistant materials, acoustic insulation materials, insulation materials. 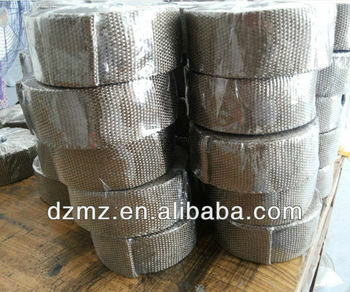 Feature:Basalt fiber tape is made from basalt fiber, Basalt fiber has properties of anti-aging, high-temperature resistant, acid and alkali-resistant, strong binding force to concrete and resin, flame retardant and good insulation, low moisture absorption, can replace carbon fiber and aramid fiber in some aspects! --Cover board, manhole and handhole sealing materials in high temperature, high pressure stove tank, caldron, etc.